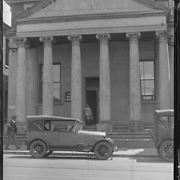 Child Welfare Department, Perth, 1930, courtesy of Truth newspaper collection, State Library of Western Australia. 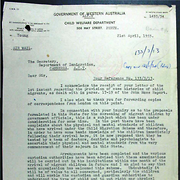 The Child Welfare Department of Western Australia was responsible for the welfare of children in out of home care for much of the twentieth century. Known as the 'CWD' or 'the welfare', the department had an impact on the lives of many WA families. The CWD ran its own Children's Homes, 'placed' children in other Children's Homes or Foster Homes and organised adoptions. It licensed and inspected the places and people who were registered to provide care and kept statistics on the number of children who were in care. The CWD also had the power to bring children before the Children's Court. In 1927 the State Children Act Amendment Act was passed changing the name of the principal Act and the State Children's Department to Child Welfare Act and Child Welfare Department respectively. Responsibility for the Child Welfare function remained with the Chief Secretary until 1931 when it was passed to the Minister for Mines. 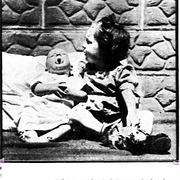 In 1934 a separate portfolio was created for child welfare. The Child Welfare Department was abolished in 1972 and its functions passed to the newly created Department for Community Welfare. His successful efforts in improving legislation for the protection of children and those in distress, his unfailing courtesy, keen sympathy, and practical help, have won, not only well merited appreciation, but better still, have left behind as the outcome of his official career a lasting tribute of better conditions to many in need. 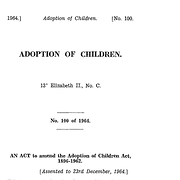 Restricted records relating to the Methodist Homes for Children are held at item 1924/0755 v1 in the State Records Office of Western Australia. 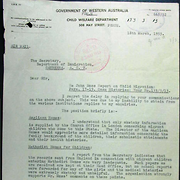 Records of the Child Welfare Department are held in Series 3172 at the State Records Office of Western Australia. Files created by the Child Welfare Department are held in this series at the State Records Office of WA. 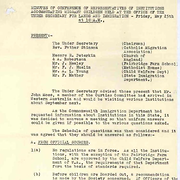 The Child Welfare Department shared responsibility for the 'care and control' of Aboriginal children who were Wards with the Chief Protector of Aborigines. The Child Welfare Department shared responsibility for the 'care and control' of Aboriginal children who were Wards with the Commissioner of Native Affairs. The Child Welfare Department shared responsibility for the 'care and control' of Aboriginal children who were Wards with the Commissioner of Native Welfare. 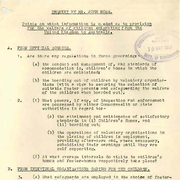 The Investigation into the Administration of the Child Welfare Department of Western Australia by RH Hicks made recommendations about the way the Child Welfare Department was organised, its practices and the institutions it subsidised. The Child Welfare Department was given additional authority through the Child Welfare Act Amendment Act 1958. The Child Welfare Department administered the Child Welfare Act Amendment Act 1962. The Child Welfare Department administered the Child Welfare Act Amendment Act 1969. The Education Act was one mechanism for bringing school-related events and behaviours into the scope of the child welfare or juvenile justice systems. The Education Act Amendment Act 1962 clarified the role of the child welfare authorities in school-related behaviour. The Child Welfare Department was the new name given by the State Children Act Amendment Act 1927 to the formerly-named State Children Department. The Child Welfare Department placed children at The Alexandra Home for Mothers and Babies (Inc) and Mothercraft Training School and arranged some adoptions from the Home. The Child Welfare Department placed young women at the Alexandra Home for Women and arranged some adoptions from the Home. The Child Welfare Department established and managed the Anglican Farm School, Stoneville. The Child Welfare Department managed Hillston, Anglican Farm School, Stoneville. The Child Welfare Department placed children at Karingal. 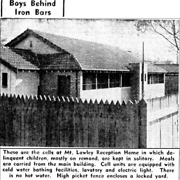 The Chief Executive Officer of the Department for Community Welfare was the guardian of children at Kurrawang Mission who were deemed to be 'native wards' or 'wards of the State'. The Child Welfare Department placed all children under the age of six years at Ngal-a Mothercraft Home and Training Centre Inc (Ngala) from 1 September 1959 (and possibly earlier) instead of the Child Welfare Reception Home. The Chief Executive Officer of the Department for Community Welfare was the guardian of children at who were deemed to be 'native wards' or 'wards of the State'. All children placed at Shiloh College were referred by the Child Welfare Department. 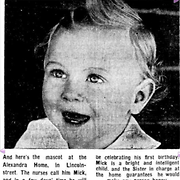 The Chief Executive Officer of the Department for Community Welfare was the guardian of children at St Mary's Mission, New Norcia who were deemed to be 'native wards' or 'wards of the State'. The Child Welfare Department placed children at Wanslea, and provided funding for its operations. The Child Welfare Department may have asked that some children were placed at the Wanslea Hostel. 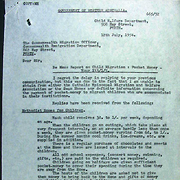 The Child Welfare Department, State of Western Australia placed girls at Wattle Grove Baptist Cottage. Sources used to compile this entry: Western Australia. Child Welfare Department, Annual Report of the Child Welfare Department, Child Welfare Department, Perth [W.A. ], 1928-1972. 1930, 1932, 1935, 1953, 1965, 1970..